To demostrate the use of SimpleMotion V2 library with Argon drives, we created a laser projector demo where the angle of two surface mirrors are controlled by two brushless servo motors and Argons. 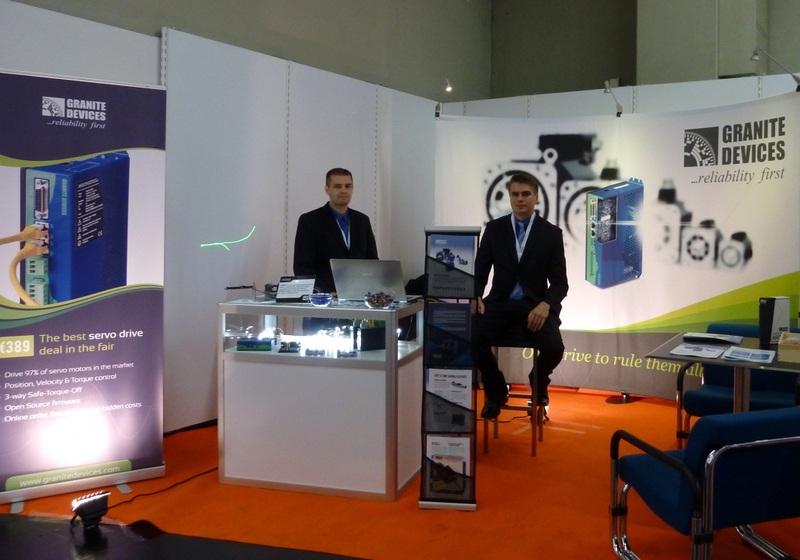 This was the demo presented also in our SPS IPC DRIVES visit few weeks ago. Motor powers are 100W and 300W continuous. Maybe it’s the most overpowered laser projector made. The surface mirrors are cut from hard disk drive platters. The smaller motor doesn’t have full smoothless any more as it was partially burned by accidentally swapping the motor cables causing too much current to it. 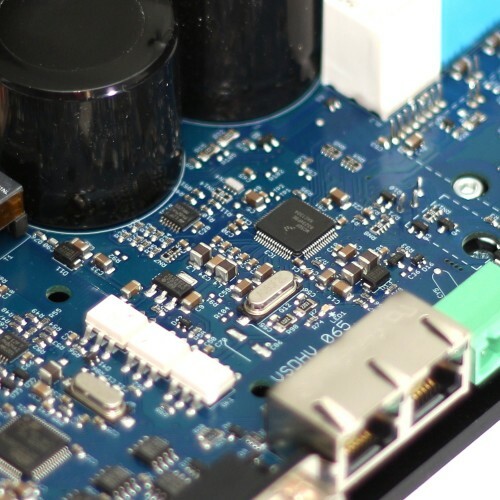 Argon firmware source code released! The source code of Argon servo drive’s STM32F205 ARM Cortex M3 microcontroller has been released under GPL v2 license! What this means to the user is that now he/she can alter servo drive behavior and functionality. For example, one can implement a pre-programmed motion sequences that are triggered by simple digital input state change (such as push-button interface) or add support for a custom feedback device. It’s also possible to implement highly advanced adaptive control where motor gains are varied depending on external variables. Block diagram of Argon drive. 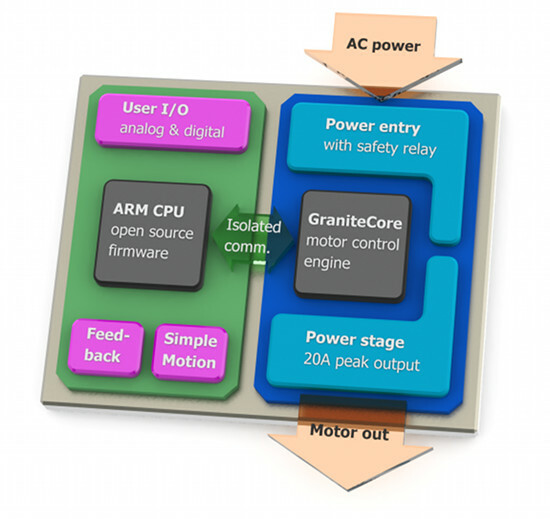 The I/O side firmware runs on the ARM CPU which connects to all I/O, feedback device and SimpleMotion ports and acts as host/controller for GraniteCore motor control core through isolated communication link. The source code is downloadable from Granite Devices GitHub page. Users are free to share and commit their changes so eventually everyone could enjoy them out of the box. Argon firmware package 1.2.0 has been released today featuring a breakthrough in servo bandwidth. This has been achieved by significantly reducing the motor feedback sensor propagation delay from read-out to control algorithm. In practice, this allows tuning higher gain values to the motor and achieve higher servo stiffness. This is especially useful in low inertia systems where machine inertia has low stabilizing effect. For full list of changes and download, visit the Wiki page. The visit in SPS IPC DRIVES 2013 exhibition at Nuremberg is over and we’re back home now! I believe the visit was well worth the effort. However, as we enrolled to the exhibition bit too late, we got a sub-optimal booth location but regardless of that we got plenty of good feedback and promising contacts. We had small demonstration system on our desk to show some of the capabilities of Argon drive with SimpleMotion V2 bus. 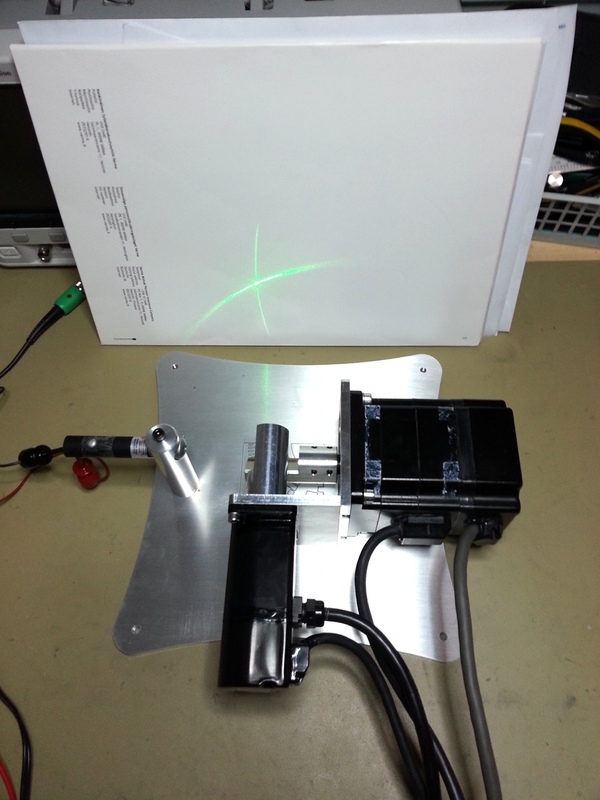 The demo is a laser projector where a green laser beam is steered by two mirrors rotated by very fast servo motors. More details, a video and making-of coverage will follow later!